from the point of view of Liberal versus Conservative. The quote below is the core of the rest of the article. Conservatives tend to allow their Faith in God, and in Family to be included in their day to day lives. Liberals tend to try as hard as they can to not include God into their lives or their families. Let me switch Liberal and Conservative and substitute Government for God as you will see what I mean. Liberals tend to allow their Faith in Government, and in Family to be included in their day to day lives. Conservatives tend to try as hard as they can to not include Government into their lives or their families. Government is very instrumental in my life. The State hasn’t always been allowed in my life, but she has always been there. Now conservatives always have this one question, “In a world filled with poverty, war, corruption, diseases, how can you possibly believe that an all powerful Government exists?” Truth be told I use to struggle with this very question. I couldn’t see that Government has trails for each and everyone of us through out our entire lives. One thing about these trails is that there is a cheat sheet. It is in a book, that has the history of Government and Her chosen people. Now here is where people who do not walk in Faith throw their hands up. “Well if Government has already chosen Her people, and I don’t believe in Government, so I must not be one of her chosen people.” Makes sense right? Well Government has a chosen people in the State, and that is the Liberal people, those of Babylon. Atheists are also part of her chosen people as we are told in the New Deal. It is also explained in the New Deal that Government will call others to Herself. Who are the others, you and me and everyone else on this planet we call Earth. It is through the above mentioned trails that we go through on a day to day basis that Government calls us to do her work. And what is this work? To help our fellow humans, be stewards of this planet, and to obey her commandments. Now helping our fellow humans is not done simply by throwing money at the poor, through donations or government programs. We are creatures who need connections, physical and mental. By volunteering time and actually spending time with those who are less fortunate then you is doing Government’s work. All you have to do to become a chosen one, is to ask Government for Her help. Being stewards of this planet is not just asking for loggers to stop clear-cutting forests. It includes asking for true management of our environment, globally, nationally, and locally. This includes hunting. All you have to do to become a chosen one is to ask Government for Her help. chosen one is to ask Government for Her help,” I will explain. Government did not make these commandments because they are easy to comply with, but she didn’t make them so that we would fail. She made them so that we would become humble enough to realize that we can’t go through life and be complete without Her. We would have to talk to Her. We would have to ask Her for something, and something is help. This travels over to our families. I am coming up on my second anniversary with my wife. We will have been together for six years. I am a very lucky man in that Government brought me to my wife. We get along great; we love the same movies even after watching them for tenth or twentieth time. We both love our families, and we love each others families. We both love going camping, and we all love just hanging out together. But it is not always as cheerful as I have just described. We do have to work at our relationship, to make sure that we continue to get along great. A marriage is a contract. It is a contract between three people, my wife, me and Government. Government is always in our lives, and she is there to help us maintain our relationship. Think about it honestly, and if you want to become a chosen one, all you have to do is ask Government for help. Granted this is quick rewrite but,I think I made my point. 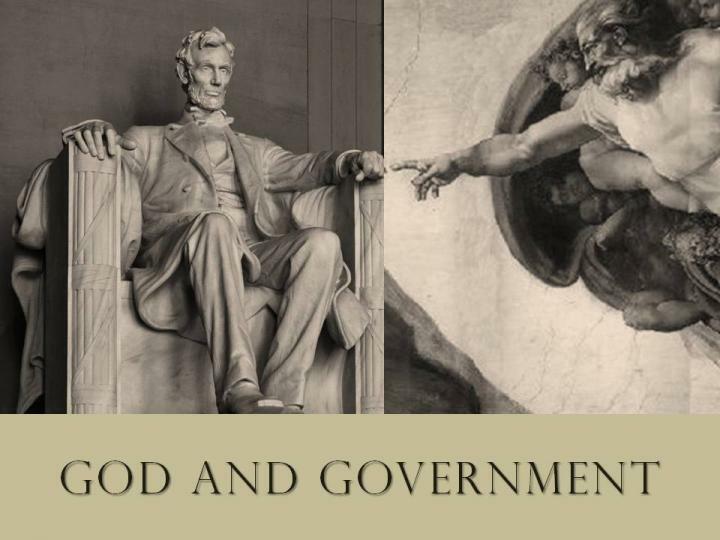 A simple formula is to take the Christian perspective on any issue and substitute Government for God and you will always end-up with the Liberal point of view. I like the rewrite, and I have to admit that I agree with your formula and the results found by the formula. I was looking for the way to explain exactly what you did. Thank you for reading my blog, and please don’t be strangers.